Minnesota's David Cobb (left -- 1,273 total yards) and Syracuse rusher Jerome Smith (896 total yards) combined for 19 touchdowns this season. Neither Syracuse nor Minnesota averaged more than 200 yards passing this season, a deflating, almost baffling stat in today’s pass-heavy age of college football. So, there’s little motivation in tabbing either Orange sophomore Terrel Hunt (1,450 yards passing, 15 total TDs) or Gophers sophomore Philip Nelson (1,288 yards passing, 15 total TDs) as bowl heroes. 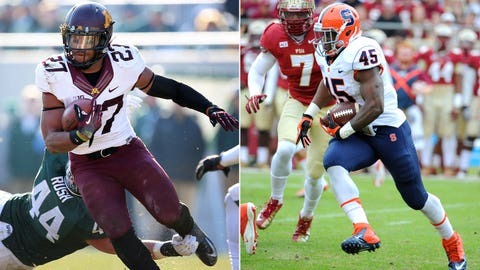 Instead, the key to Friday’s clash — where neither program holds the home- area advantage — likely entails how the Syracuse defense combats Minnesota’s commitment to the power-running game, led by sophomore David Cobb (more on him later). Of the Orange’s final eight games — and excluding the outing against run- heavy Georgia Tech — they allowed respectable averages of only 118 rushing yards. That type of proficiency remains essential to Syracuse’s chances of beating Minnesota, while forcing the Golden Gophers to throw often in non- emergency situations. Here’s an interesting stat: Of his 10 games for the season, Nelson completed only 10 or more passes three times; and within that span, the Gophers quarterback didn’t log a single outing of 25 or more attempts. How’s this for balance? Cobb (1,273 total yards) had the same number of touches (235) as the Gophers’ top two quarterbacks (Phillip Nelson, Mitch Leidner) had pass attempts … and it would have been a blowout in Cobb’s favor if he hadn’t logged nine or fewer carries in four of his first six games. Need a primary reason why Minnesota was competitively stout in the latter half of the season … aside from the Big Ten’s galling lack of depth at the bottom of the conference? Look no further than the out-of-nowhere development of Cobb, who rushed for 100-plus yards six times and notched back-to-back outings of multiple touchdowns in September. 1. All six of Syracuse’s losses came to members of the ACC (Georgia Tech, Florida State, Clemson, Pittsburgh) and Big Ten (Penn State, Northwestern). 2. Minnesota averaged just 7.3 points in its four losses (Michigan State, Michigan, Wisconsin, Iowa). On the flip side, the Golden Gophers averaged 35.8 points in their eight victories. 3. Away from the Carrier Dome, the Orange averaged only 13 points this season. 4. In his final six games, the tailback Cobb averaged 144 total yards. Syracuse should be applauded for bouncing back from an 0-2 start and posting a non-losing record in its inaugural ACC campaign — especially after former head coach Doug Marrone (now with the Buffalo Bills) and quarterback Ryan Nassib (now with the New York Giants) graduated to the pros. However, the Orange’s defeats to Clemson, Florida State and Georgia Tech had absurd average margins of 49 points. And given the Gophers’ late-season prowess in the running game, it’s fair to draw parallels between Minnesota and Georgia Tech — in terms of how Syracuse might struggle to combat physical play in the trenches.